Dunlop ATV Tires - Quadmax Review and Best Buys. 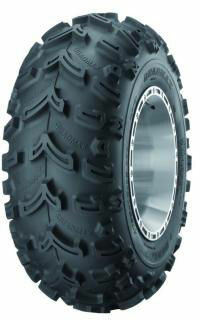 The Quadmax Dunlop ATV tires are the high performance replacement ATV tires of the product line. Dunlop supplies many of the tires that come as original equipment on several ATVs. It's possible they suffer a little bit of a bad rap because of that. OEM tires have to make a lot of compromises, so they end up just being adequate in most conditions. They are rarely great at anything. It's just the nature of the beast. When it comes to the new Quadmax tire - you can forget everything you thought about OEM Dunlop ATV tires! If you want to see the best deals online today, just click the link. Quadmax - What does it mean? Dunlop says it set out with two goals in mind. First, design a tire that delivers superior handling in the harshest conditions. Second, create a design that provides excellent mud traction. Unlike some other tire manufacturers, Dunlop has a broad range of tire building experience to draw on. Making both automotive and motorcycle tires for decades does tend to teach you a few things about tire construction. A huge test facility in Huntsville, Alabama with access to every type of terrain imaginable came in handy too. Many designs were considered and tested until the final version of the new Quadmax was developed. Check out the video below for more info on these Dunlop ATV tires. The Dunlop Quadmax ATV tires do have some unique features. The two ply nylon carcass provides light weight combined with a stiffer sidewall for more cornering stability. This construction style also offers a 5% larger footprint for better straight line traction in both acceleration and braking. An additional goal was to reduce tire weight. This was achieved through the design and manufacturing processes. The reductions are notable - the front Quadmax is nearly two pounds lighter than a comparably sized tire and the rear sheds nearly five pounds in similar comparisons. The substantial weight savings reduce unsprung weight which in turn, reduces the energy needed to accelerate, brake and turn. More responsive steering and suspension action are added benefits, producing better overall handling. This is especially noticeable on lighter and less powerful ATVs. Next, optimum tread-block shape and pattern ensure maximum straight-line and cornering capability. Big, asymmetrical, chevron-shaped center blocks are three quarters of an inch tall and provide plenty of mud-gripping forward traction in all but the most serious bogs. A 45-degree transition from the tip of each chevron to the tapered shoulder blocks provides smooth and predictable side grip when cornering. Finally, Dunlop applied its expertise in tread compounds to produce an advanced rubber that provides good grip in both wet and dry conditions while delivering excellent tread life. How Do Quadmax Dunlop ATV Tires Work? Just fine, thank you very much! More details? Alrighty then. Actually, the "just fine" comment is pretty accurate. We feel that the these Dunlop four wheeler tires do offer significantly better handling and traction than OEM tires in most conditions. The stiffer sidewalls and low profile give a more secure feel when cornering and the 3/4" lugs give much better forward bite in muddy situations. We also noticed a "livelier" feel on mid-size or smaller ATVs with these lighter weight tires. Survey responses from many owners give the Dunlops good ratings for overall ride and handling and good tread life. The most common complaints were from owners that wanted better performance in thick mud. But to be fair, the Quadmax is not intended to be a "mud tire". We think these ATV tires are a good choice for general trail riding on a variety of surfaces and terrain. They have good build quality, light weight, good tread life, and good ride and handling characteristics in a wide variety of conditions. If most of your riding is in deep mud - a more dedicated mud tire may be a better choice. The 3/4" lug depth is just a little short for serious mud. But if your riding involves a lot of different types of terrain (like ours does) these Dunlop ATV tires deserve a look.